How about trying something a little different in your vegetable garden this year? Something a little more challenging than tomatoes, green peppers, or cucumbers. A few years ago, I was inspired to think differently about my vegetable garden after visiting the Caribbean. There, I saw vegetable gardens thriving in almost every yard, reflecting the wide variety of foods seen on Caribbean dinner plates. I started incorporating some of my favorite Caribbean foods in my garden in Canada. I knew this wouldn’t be easy and learned just how challenging it was after years of experimenting with different plants. Simply put, our Canadian summers are usually not hot enough or long enough for some vegetables to grow to maturity. After years of trial and error, I have three success stories to share. One of my early experiments was planting Okra (Abelmoschus esculentus), a high-fibre slimy pod-like vegetable also known as gumbo. You may know it as one of the ingredients in the famous New Orleans dish called jambalaya. But in Barbados, Okra is a key ingredient in a polenta-type dish called Coucou. The Okra plant has a unique structure. The flowers look like Hibiscus and the pods seem to be upside down on the stem.At first, I started the seeds indoors then transplanted them in early June. I learned that Okra seedlings have very brittle tap roots, so they don’t transplant well. Then I started the seeds outdoors — which proved to be more effective. I was elated when the plants grew to almost one metre high and I harvested enough Okra to freeze for the winter. Sadly, the following year, the seeds I collected did not germinate. The year after that, I bought seeds from a seed company, but the plants were stunted and had very few flowers. Perhaps the seeds were not viable, or the summer was cooler and wetter than normal that year. 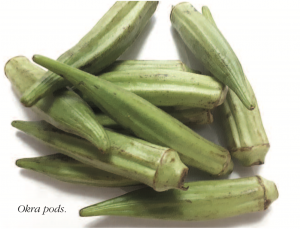 Okra plants like daytime temperatures above 26°C and nighttime temperatures above 15°C. Sometimes, Ottawa summers just don’t cooperate. I tried planting Okra last summer with moderate success — I did not get the same yield as my first attempt years ago. But I’m determined that summer 2019 will be my best year yet, weather permitting, of course. Dasheen is another tropical plant that I have successfully grown in my vegetable garden in Canada. You may not be familiar with the word Dasheen, but you will certainly know the ornamental plant called Elephant Ears (Colocasia esculenta). 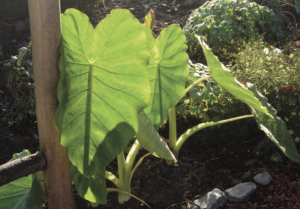 The root of Elephant Ears is called Eddo or Taro, an edible root similar to a potato. In Trinidad and Tobago, the young tender leaves of the plant are used in a dish called Callaloo,a soup-like vegetable stew which is a traditional Sunday meal. Dasheen thrives in ditches in the Caribbean. So, I put the root in a moist part of my garden with filtered sunlight. It also needs heat. The root will not sprout until the soil warms up, usually by late June. But once it starts growing, it will send out new leaves every week. A row of these plants in my garden allows me to enjoy Callaloo at my leisure. Fruits appear on the vine about two months after the first true leaves appear. I try to pick the fruits when they are still young, very green, and the skin is delicate — similar to the skin of a cucumber. The seeds are very difficult to find, so I leave at least two fruit on the vine to harvest seeds for the following year. With ideal growing conditions, I have picked two to three fruit on each of the vines that I plant. These three classic tropical vegetables/fruits are some of my attempts at incorporating some Caribbean foods in my garden. I have had many failures. But when I succeed, the reward is knowing that years of experimentation paid off. Perhaps my successes will inspire you to try something different in your vegetable garden this year. Claudette Russell has been gardening on her two-acre lot in Carlsbad Springs, in the rural south east corner of Ottawa, for 15 years. She volunteers with Master Gardeners of Ottawa-Carleton and is constantly experimenting with different plants to make her garden better every year. Another experiment in my garden is Bitter Melon (Momordica charantia), a vine belonging to the gourd family and very similar to cucumber. In the Caribbean it is known as Carilla. The vine produces warty oblong fruits with a bitter taste. It truly is an acquired taste, but the medicinal benefits include lowering blood sugar levels and blood pressure. Bitter Melon is considered a super food because it has twice the beta-carotene of broccoli, twice the potassium of bananas, and twice the calcium of spinach. Like other summer vegetables, the plant requires three to four months with hot temperatures to reach maturity. I have had varied success growing Bitter Melon. The successful years have been when the summers are hot and humid. Many vegetables require at least three to four months of warm to hot weather, and six to eight hours of sun each day to mature.Tropical vegetables similar to those highlighted in this article should be treated like corn, squashes, and melons. In Ottawa, you can plant them directly in the ground around May 24, or when the soil is about 15°C. Avoid purchasing seeds from department stores. Find a reputable seed company that provides guarantees and understands your gardening zone. Get a head start by starting seeds indoors in a peat pot around May 3, and transplanting seedlings after the danger of frost is past. The peat pot will reduce the risk of damaging roots during transplanting. Pick some of the young vegetables before full maturity to encourage more flower production in the early part of the season. Save some of your seeds at the end of the season by letting one or two vegetables/fruits ripen on the healthiest plants in the garden.